One of the defining attributes of an Apple product is the out of the box experience. That refers to the experience you have with a product when you first take it out of the box, to the time you start using it. I find Windows-based machines unusable out of the box. It takes quite a bit of tinkering to get things to a workable state. A freshly registered Mac is ready to do most of what you bought the device for in the first place. Download Apple's suite of apps for free from the Mac App Store, and you will likely never have to add anything else to your workflow. That goes double for iDevices. Out of the box, the iPhone and iPad are unparalleled with regard to how easy it is to get up and running. You might pick at a few of Apple's default settings or apps as not being best in class. But in aggregate, the overall experience is best in class. Apple Mail, Safari, iPhoto, Camera, Contacts, and Calendar, are all so much better that the equivalent applications that came before them. For the majority of people, these apps are ideal. That is not to say that one can't find a better calendar app. But better is subjective. Even if you found one that is better to you, thee are still reasons that the default calendar is the one to use. There are things that the defaults can do that third-party apps cannot. The defaults are designed to work together, and have tight integration with the operating system. Siri is an excellent example of how the defaults are tied to the OS in ways that would be difficult to untangle. When you tell Siri to compose and send an email, she (I think of Siri as a she) must know which email service to use. You can use any service you want to handle your emails if you want to do it yourself, like a neanderthal. But to have the built-in assistant do it for you, you will have to accept the service she can natively use. The same thing goes for calendars and reminders. Sure, there are plenty of calendar apps you can choose from. 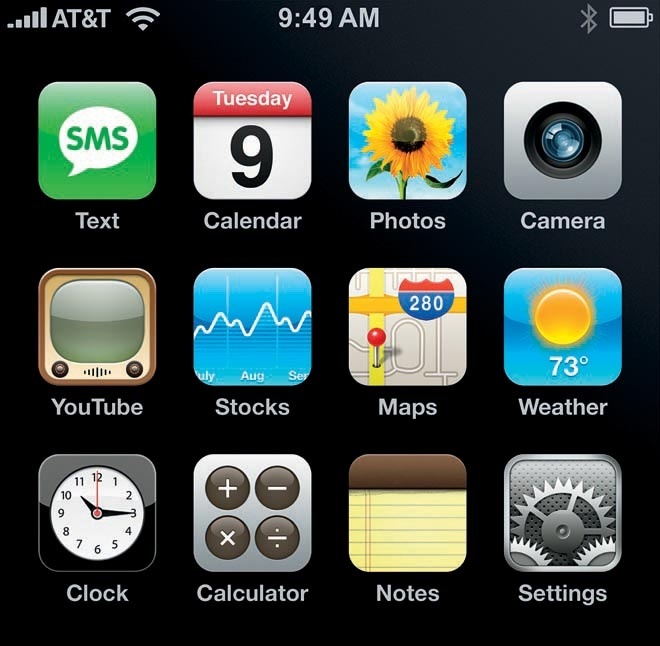 There were reminders apps before Apple rolled their own. But if you want Siri to set up your appointment or reminder, then you have to use the app that she is comfortable with using. You simply cannot get this level of integration from a third-party app, no matter how pretty it looks. Notification center also takes advantage of information inside of default apps. The Today screen is a great example of this. On the iPhone, if you touch the weather information, it opens the default Weather app. There are plenty of weather apps the have more features. But if you just want a quick overview of what is going on hour by hour, this is a great setup. Also on the Today screen is a summary of your schedule based on the default calendar. The calendar you prefer with more features, is not going to show up in this area. If you want Siri to send a message, it is unreasonable to expect her to sift through your folder of messaging apps to try and figure out which one you want to use at that moment. Again, the default to the rescue. The defaults are tied to critical and useful services in ways that make straying from the defaults unappealing. As great as I think the defaults are, I am the first to start tinkering whenever I get a new iDevice in hand. That is because I have a few special needs that make the default settings a non-starter for me. My vision is too poor to comfortably use any iDevice out of the box. Fortunately, iOS contains all the settings I need to customize the experience for comfortable use with low vision. There are a handful of apps I use that provide additional functionality with regards to accessibility. Special needs does not just refer to physical challenges. It also may have to do with particular interests or functionality. Apple does not provide any built-in apps for drawing or freehand writing. That is clearly something that a lot of people enjoy, and the iPad is perfectly capable of doing. It does not represent a majority. But if that is your special need, then it is worth some modification. Maybe you need an email client that transcribes written text into Klingon. That is definitely not a default feature, and there is no setting to make it happen. If you have no special needs, you will be very happy with the defaults. The main reason people stray from the defaults has to do with playing nice with others. This is a major bone of contention I have with the tech wold, and the tech press in particular. They believe that every Apple product and service should work seamlessly with every other product and service. They will mark points from the Apple product for having a proprietary solution. I don't. In fact, I am perfectly happy with proprietary solutions, and do not want them to work seamlessly with everything else. To some extent, this goes back to premium vs. generic. People who pay a premium for premium devices and services should expect to enjoy benefits not offered to those who don't. Those left outside of the premium advantages quickly gravitate to generic solutions that. attempt to mimic everything the premium had to offer, at bargain-bin prices. I abhor IP thieve and copyists. The Apple ecosystem has many advantages because Apple did a lot of things right, at great expense and risk to themselves. Choosing a different system should mean that you do not have access to the same advantages. The #1 reason people choose alternatives to the defaults is so they can be interoperable with another system. It is also the #1 reason for technical issues with iDevices. An example would be messaging. iMessage is an outstanding, free app and service for communicating with people using iDevices and Macs. It is not optimized for communicating with people who have Android , Windows Phone, or Blackberry devices. There is a whole world of people with whom you might want to send a free text, and who may not have an iPad or iPhone. Instead, they have the alternative to the Apple product. That means that you have to install an alternative to the default on your iDevice in order to communicate with the outside world. These days, the outside world consists largely of people who use Google's free services. Beyond Search and YouTube, there is a reason why I choose not to use Google's services. It is the same reason I don't want to communicate with people who use Google's free services. Those services, such as Gmail and Hangouts, exist only for the purpose of tapping your communications, and selling your personal information to the highest bidder. Gmail is not there so that people can have free email. That existed before Gmail. It is there so that Google can read your mail. I don't want that on my system, and I don't want to send or receive mail from people who use it. That is because my portion of the exchange is still exposed to Google's prying eyes. No thanks. Keep that off of my iPad and iPhone. Apple respects the privacy of its users, and its products and services reflect that fact. If you do not use iMessage, I don't want to chat with you over a messaging service. With iMessage, I know that the message is going directly to you, and no one else. If the government wants to read the contents of that message, they are going to have to go through an awful lot of trouble, time, and expense to get their hands on it. They are not going to simply be able to waltz through a side door that Apple built in to make it easy to spy on what you are doing. Third-party alternatives carry more hassle and more risk. Every additional username and password you have to enter for basic services, is added inconvenience and risk of exposure. I never have to enter my credentials for Mail because it is established at setup. If, however, I wanted to add Yahoo Mail to the mix, I will have to enter credentials specific to that service. Now, I have to keep an ear out for news about Yahoo hacks and exploits. This is true for every non-Apple service I use. Just last week there was a major leak of Snap Chat information. 4.6 million people got their user information, including phone numbers, exposed on the web. Looks like they should have just used iMessage. Apple and Amazon have my credit card information. But putting that information into a Google service is like visiting a Red Light district without a condom, or body guard. There are places where you shouldn't even carry a wallet. In the title of this post, I compare the iOS ecosystem to a gilded cage. Inside that cage is peace and harmony, and everything just works the way it's supposed to work. That is a little like being an infant in the home of loving parents. There are kid-safe spaces. The food is nutritious and tasty. Your clothes are chosen for you, and fit perfectly. Updates come to your food, clothing, and surroundings as you grow up. Inside your parents home, you have wholesome entertainment and a challenging education that expands your horizons. As an adult, you might even choose to stay in the family home, and work for the family business. The only price you pay for this idyllic existence, is that you have to remain within the family. But that is not how it works out for most people. Sure, everybody needs a good start in life. But the more adventurous kids are not the ones who obey their parents and respect the boundaries set before them. Rather, they are the risk takers. They are the ones who dare to jump the fence just to see what is on the other side. They are the ones who make questionable friends a little too early. They are the ones with the interesting stories to tell around the campfire. Their parents are divorced, and life doesn't come easy for them. But they are resourceful, and are used to things not working the way they should. That's how Android feels to me. It is edgier, less polished, less perfect, less safe. The defaults don't matter because there are much better alternatives. There are no boundaries and no safeguards. There are no private schools with uniforms, no designer clothes laid out for you, and no curfew. You're living hard and fast and free. No one tells you what to do. No one stops anyone from doing unto you. It is a very different mentality, and a different lifestyle. Personally, I like the gilded cage. I like the three square meals a day and the gated community. The tax rate is high, but the neighborhood watch and emergency services are top-notch. In tech, I have had my adventures and paid my dues. Now, I want nice things that just work. I no longer have much in common with the crowd that thinks reinstalling Windows every couple of months is life in the fast lane. I just want to sit down to my device of choice, and get my work and play done without having to fiddle with the machine. I love defaults. I love the platform that makes defaults useful and preferable. Seldom are you going to see me writing a post about the best alternatives to some built-in, Apple service or app. I am more likely to write about how to get the most out of what Apple has to offer. I talk about how to make the platform work for you. As a user, you should never have to work for the platform. If living the computing good life means that I am trapped in a gilded cage, feel free to throw away the key.